Joel Stewart is a self-described “can fisherman” in that he fishes for anything he can, anywhere he can, any way he can and any time he can. He will fish with any equipment but prefers a fly rod to all others. He was born in Helena, Montana and raised in Great Falls, Montana. He began fishing before he could walk. He started tying flies commercially at age 8 for the Great Falls Sporting Goods Company and began working full time, during summers, for Mountain Bait and Tackle in Great Falls when he was 12. He also worked as an apprentice rod builder for MAW Rod Company and as a skinner in for Great Falls Taxidermy during the winter when fishing slowed down. After graduating from CM Russell High he enlisted in the Navy in 1985 as Fire Control Technician working on the Tomahawk weapon system. After achieving and still serves on active duty as a Surface Warfare Officer. 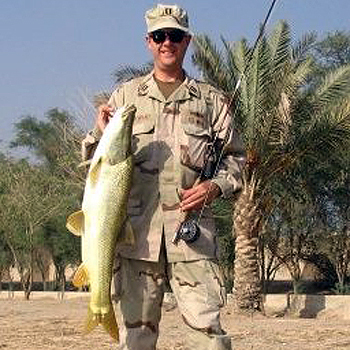 He was assigned to the staff of Multi-National Corps Iraq in Baghdad in 2005 and during that tour started the Baghdad School of Fly Fishing which later became the Baghdad Anglers Club and School of Fly Fishing. He has circumnavigated the globe and fished on six continents. He calls home anyplace the Navy stations his family. Presently he is stationed in New Orleans as the executive officer for the future U.S.S. ANCHORAGE (LPD 23), which will be delivered to the Navy later this summer. After the ship is commissioned in Anchorage, Alaska next spring, he will assume command and complete the ship’s entry into fleet service. He always has a fly rod in his sea bag, and uses his liberty time to seek opportunities to fish new waters and catch different species wherever in the world his duties take him.